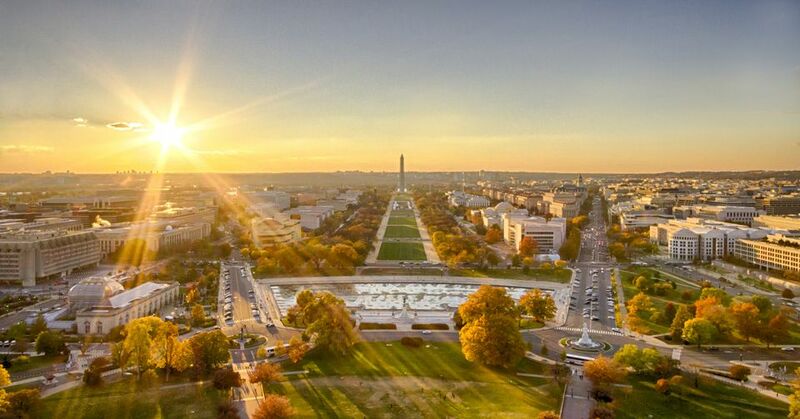 The Washington, DC area is a great place to live with a variety of choices for work, recreation and lifestyles. While everyone has different preferences, you might be wondering if the city or the suburbs of the nation's capital are right for you. Here are the pros and cons to living in the Washington, DC area. Want to know what residents love or hate about the region? See some of the shared responses below. Plenty of things to do. The Washington, DC area has lots of cultural activities, entertainment, shopping, festivals, outdoor recreation, and great restaurants. Mild weather and four seasons. The Mid-Atlantic region has relatively mild weather and fewer natural disasters than other parts of the United States. Residents look forward to the beauty of the seasonal changes. Central location. The region offers a variety of getaways within a few hours drive. You can enjoy a day trip or weekend getaway at the beach, the mountains, or several cities including DC, Baltimore, Annapolis, Wilmington, Philadelphia, and New York. Diversity of people. The Washington, DC area is home to a wide variety of people from different ethnic backgrounds, nationalities, religions, and economic levels. Overall the population is highly educated which makes it an interesting place to live. See Census information. Variety of Neighborhoods.The region has everything from urban condo/apartments to suburban townhouses and single family homes to rural farmland. You can choose to live in a community that best suits your lifestyle. High stress level. Generally, residents of the Washington, DC area work long hours. A majority of the people are highly educated and motivated to succeed professionally. Many tend to sacrifice their personal life. They don’t know their neighbors and are too busy to socialize. It can be difficult to meet and get to know new people. (Possible Solution: Be assertive and seek out new activities and opportunities. There are lots of interesting people to reach out to, but it can take some effort to make new friends. Plan regular family activities and take long weekends or vacations as often as possible). Political Influence. Scandals, political demonstrations and daily proceedings on Capitol Hill make the DC area an interesting place to live. As the nation’s capital, the government has a big impact on the region. The job market is strong because of government employers and contracts. The political climate is constantly changing and the world’s eye is always on this city. What Do Residents Love or Hate About Living in the Washington, DC Metro Area? It's a Fascinating City -There's always so much going on in DC. It's a great place to be if you like to be busy and immersed in cultural activities. I've lived here for 5 years and am always amazed by things that I haven't yet discovered. It's an expensive place to live but you can always find free things to do. It's pretty easy to get around by Metro but parking a car is pain. You have to plan extra time to get just about everywhere because you never know when you will be delayed by traffic. DC's OK - I really wanted to live in DC when we moved here seven years ago for my significant other's work. There are plenty of positives to living in DC: museums, decent climate, and lower unemployment rate (approx. 5%) to name a few. Some negatives: housing is out of reach for many (we're fortunate that we can afford a 900 sq ft condo--that was 2x the price at less than half the space without a 2 car garage and large yard of our single family home in the Midwest), traffic, traffic, traffic, and employment is not the best for older workers. For example, I came here in my mid 40s with many years of design management experience and found myself competing for jobs with eager young professionals who have great educations and little experience who are willing to do the same job for less than half my salary...I say let them have it. Looking forward, I await the next chapter and hope it's someplace else but until then this is home and I'll enjoy all that DC has to offer. I loooooove DC! - I live in DC proper and absolutely love it! The culture, the people all the amazing restaurants right in your back yard. I'm from Boston and also spent three years in Manhattan. I think DC has a great mix of the NY culture (museums (that are more affordable), restaurants, etc...) and Boston history (all the amazing monuments and sites all over the city). In addition, I feel that DC residents have a better work/live balance. The city has great work opportunities but at the same time it's not all work and no play. I'm thrilled with my decision to move to DC! I thought I would love it - D.C. has so much to offer and I thought that I could love it. I have a small house in Capitol Hill, got a decent-paying job, and live close in enough to walk many places. However, this city is so full of crime and filth and other soul-killing stuff. I can't believe that my quality of life is so much worse, especially now that I am paying twice as much to live here as in my last city. I love my job and don't want to move, but am certainly considering it. The Smithsonian and other museums, cultural spaces etc. are all beautiful but you can't live in them! I guess it's fine if you like being robbed, harassed, and living with terrible city services and an unresponsive city government. Sure, in that case, it's a terrific city. If you live in D.C. and never need anything from anyone, you'll be fine. But if you do experience crime and other problems in your neighborhood, you are on your own. Love it here - I have lived in 5 U.S. cities and 2 other countries. DC is the best for me, based on lifestyle and standard of living (v high). I can use my car to get to work, errands, day trips. Cosmopolitan people everywhere - diplomats, military, emerging markets ppl, non-profit, finance, politicians, lawyers, etc. A 30 minute drive can get me to VA vineyards, MD sailing, downhill skiing (MD, PA), and farther I can get to NC outer banks, Philly, Manhattan, or further into the mountains. Fantastic public schools and private schools in the DC/VA/MD area (and some bad). Great ethnic food. Fun national sports teams (hockey, basketball, baseball, football, college level as well), easy to get tickets and attend venues. Concerts are reasonably priced - at Verizon Center, 930 club, etc. Three airports so range of options and prices (DCA, IAD, BWI). Superb climate, summer seems like 5+ months, can get humid. Easy to get to and enjoy museums, performing arts, zoo, etc. I hate it - The jobs are great.. the traffic is a nightmare.. and dating is horrible. Entertainment is excellent...but it takes a million years to get anywhere if you're single like me .. and live far out... just to get cheaper living..with more space. I don't like it here. and hope to get out of here. I liked it better when I was younger...but as I am older.. I feel like.. I'm wasting time. Ok for the short term - DC is fun in the short term and the single life, but I find the quality-of-life lacking as I mature. To afford any reasonable amount of space to live in, you have to move farther from the city. This means more hours in traffic and less opportunities to enjoy events in town, mainly because of the long commute and hassle with metro/parking. Lots of people move here temporarily to make a lot of money, get some experience, and get out. For that I think it's great. But once you have a family it gets tough - daycare is very expensive and there are long waiting lists, especially for the ones with good ratings. Many of the daycare providers are foreigners, meaning that English does not come easy and your children may pick up some bad habits. DC is a *Great* Place to Live!! - I agree with the pros -- so much to do here in terms of outdoors, cultural activities, restaurants, nightlife, roadtrips, fascinating people from all over the world. Re. the cons -- traffic is awful, BUT... you likely will NOT need a car to commute to work, so you likely will not need to drive during prime traffic hours. Real estate is expensive, but as others have mentioned, there are so many fun, FREE activities that really add to the quality of life once you can afford the rent or mortgage. However, one big downside is that there are not so many less expensive options to eat out... and many services such as getting a haircut are ridiculously high. And... the public school system is AWFUL, so once I'm ready to have kids, I'll head out to No. Va or MD because don't want to pay private tuition. Even so, I absolutely love it here more than any other place, and I've lived in beautiful Colorado, California, the South, outside Boston, Philly, NYC, and abroad.